The NCMS Plan is dedicated to improving the health and wellness of our members. By providing participating practices the resources to educate and inform, we can make a difference in employees’ lives that will lead to a decrease in necessary medical care. There is a direct link between the medical costs of your employees and the premiums you pay for health insurance. By actively working together to control claims and to lead healthier lives, over time, we can make a difference. 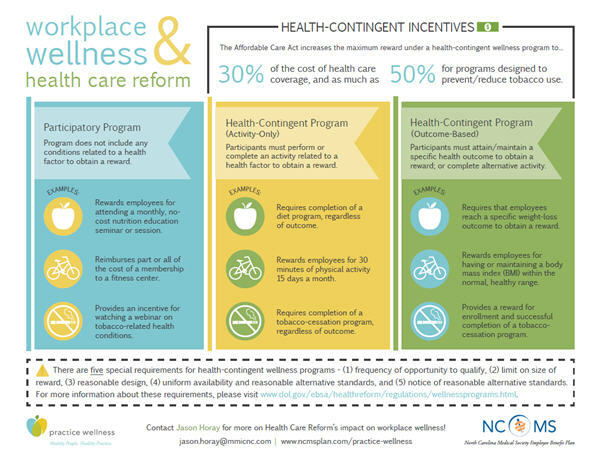 The CDC featured the NCMS Plan in a Case Study outlining how the Plan is working with practices across North Carolina to integrate a long-term, sustainable wellness strategy that includes lifestyle and risk-reduction programs; policy development; annual exams and preventive screening; biometric screenings; and healthy living presentations that link employee well-being with organizational performance. 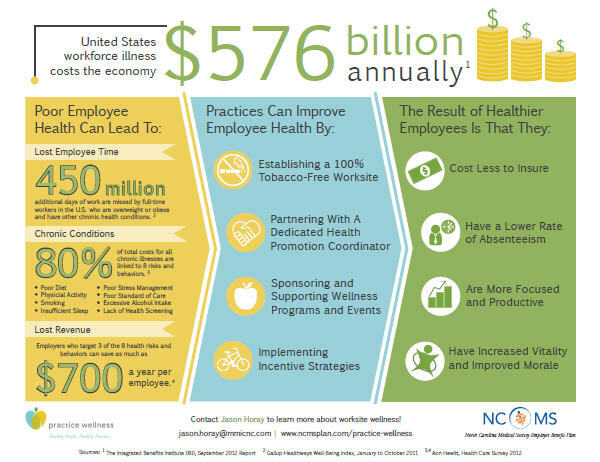 For more information on how you can get your office to practice wellness, click on the links above, or contact Jason Horay at Jason.Horay@mmicnc.com or 919.878.7530. Jason has been recognized as one of the Top 100 Health Promotion Professionals in the country by WELCOA (The Wellness Council of America), the most respected resource for workplace wellness in America. WELCOA annually recognizes the top health promotion professionals who are creating, coordinating, and maintaining high level health promotion programs, implementing innovative solutions for health improvement and culture change, are leaders and role models in business and their communities and have an inspiring vision for the future of our industry. 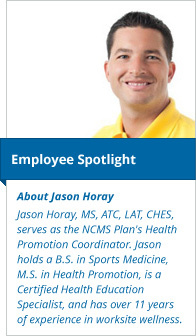 Jason has also been featured in the WELCOA’s Member Spotlight highlighting best practices of accomplished health promotion professionals. To download pdfs of infographics below, click on the infographic image.